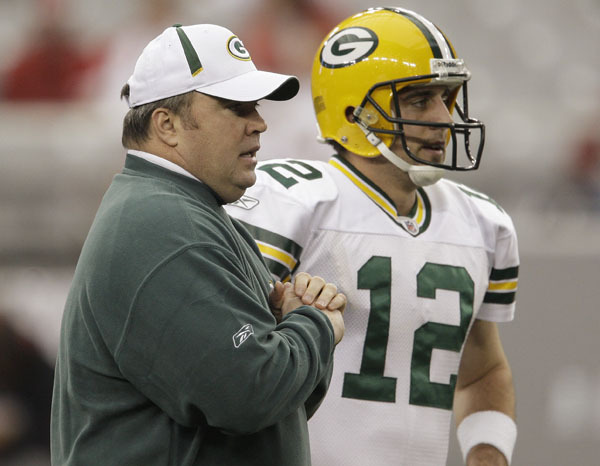 Packers-Cardinals III « Roll Out the Quevedo! Wow, what a little rivalry Mike McCarthy has created; to Ken Whisenhunt and the Cardinals at least. I’ve linked a couple of articles from the Arizona Republic. I love reading the opponent’s newspapers. It gives me a real sense of what is going on in the other city. All I can say is WOW. Ken Whisenhunt seems to have an issue with McCarthy’s game planning and utilization of his starters. In the third preseason game, the Packers played their starters into the 3rd quarter. Almost every team in the NFL does this. It’s the only preseason game where the starters play into the 2nd half. Now he doesn’t like the Packers plan in Week 17. Someone should remind the Cardinals of the importance of the 5th seed. The Cardinals hosted the Eagles last year in the NFC Championship game as the 5th seed. Can someone be so dumb? Here are some articles. Enjoy.